This entry was posted in US Markets on March 29, 2014 by William Randall. I’ve been given the privilege to share some of my insights and experience with the use of bandpass filters in applying the Hurst methods. Instead of a long winded dissertation, I thought it best to begin with an example. 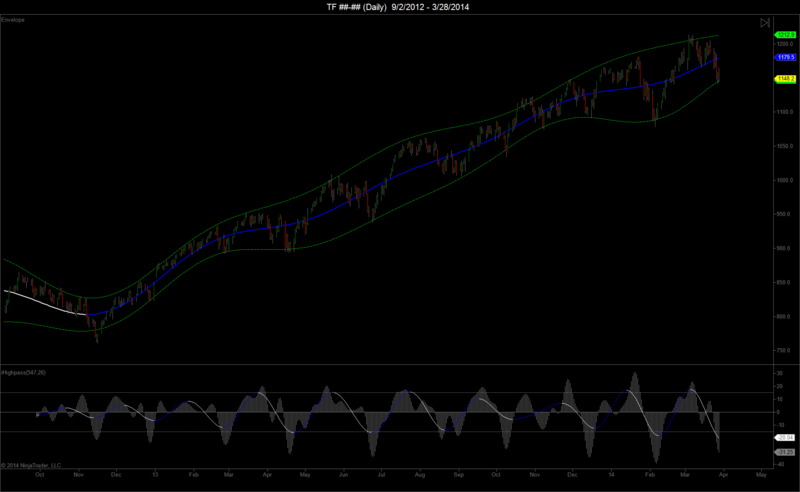 The chart below is a daily chart of Russell 2000 futures. The indicator at the bottom shows the 10 week (56 day) wave cleanly extracted using a bandpass filter. I’ve also included the highpass data which I have slightly smoothed. In Profit Magic Hurst referred to output of a highpass filter as an “inverse moving average”, a description I found a bit misleading. Nevertheless it is a great technique for isolating a dominate wave. The envelope I’ve drawn around the price action is a variation of Hurst’s classic “constant width” envelope. The bands expand and contract with the amplitude of the shorter waves inside, a “variable width” envelope. The centerline represents, in Hurst speak, the sum of the waves longer than the 20 week wave. While I don’t use them for phasing (obsolete remember? ), the bands provide an excellent indication that the contained dominant wave has reached an extreme, particularly at lows. On the chart below I’ve zoomed in and added the familiar 20 day FLD and the output of the 20 day bandpass filter. With the 10 week and 20 day waves at extreme lows and the price action at the bottom of the envelope, barring an unforeseen duration fluctuation or straddle, it is a high probability the markets are at or approaching a 10 week low. Impressive job and spectacular charts! Thank you for sharing. I think that the combination of filters together with ST could be a very strong move. ST is placing a potential 56 day trough for this week (I would follow option A of David’s weekly analysis), your filters also do and mines too….I’m also envision US markets bottoming late this week. 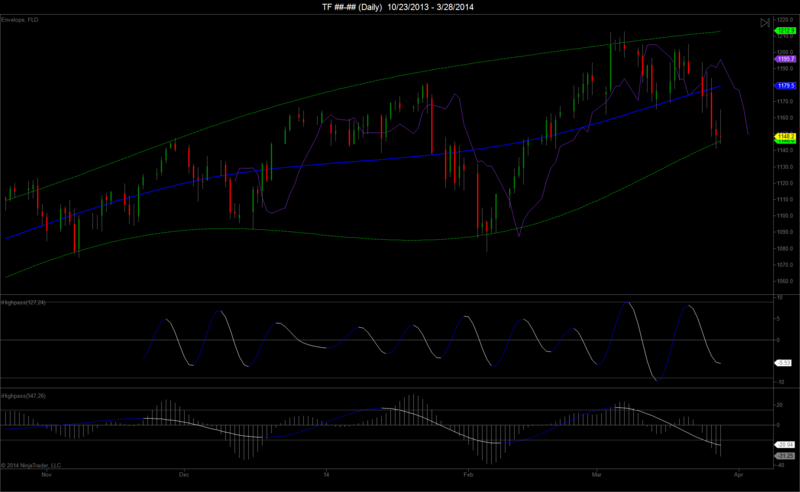 I expected a retest of this highs this week out of a short term cycle low. 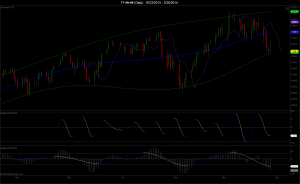 A 10 week low now looks more probable from last week’s low. How do the 40 week and 18 month cycles look? Now that some of the indices have put in new highs, it is a good bet that the 56 day wave low is in. I still like to see a higher low of the 10 or 20 day wave (the classic TLL) before I start celebrating. As for the long waves, the amplitude on the 80 week wave has been reduced to almost zero. It is so small that it in my opinion it is providing virtually no lift to price. The amplitude of the 40 week wave has contracted over the last two oscillations but not nearly to the extent of the 80 week wave. It should provide some lift on this up leg. The killer wave is the 10 week (presently 56 day) wave. Throughout market history it has always been the most consistent wave. I can usually tell what the longer waves are doing by watching the 10 week wave. It continues to put in higher highs (9 consecutive? ), therefore the trend remains up. 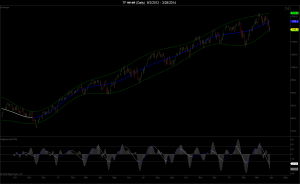 The reason why I ask about the 18 month and 40 week is that I still expect a low for both by the end of May. I still believe the cycles have expanded and that early Feb. was only a 20 week low. We likely just saw a 10 week low and if we roll over here in the coming days, we should see a decline into an 18 month low. There is nothing to validate this view yet, but that is what I am looking for. We’ll know in the coming days if the strength out of the last low can lead to a new upleg. My impression is that I also think that 80 week cycle has almost disappeared, but at the same time, I consider we have “seen” a very subtle trough in early February; when I see this kind of behavior in my indicators, something bad is coming. I think it could be also happening right now with the 56 day cycle, it is probably we have seen another subtle trough few days ago as William is also suggesting. Again, when I see this in my indicators, something bad is coming. It is very, very early to talk about this, but it is possible that we are seeing a 4 year cycle peak, and probably longer. I’m feeling very bearish right now. According to my analysis methodology, the indices are entering the leading edge of the window of a 4 year high. Even though the conventional wisdom states that highs are notoriously difficult to forecast, I have found that certain common denominators exist at highs. If you examine the prior 4 year cyclical highs, you should be able to discern those common factors. I agree it is a bit early to be overly concerned. A review of the prior highs with a properly constructed nominal model will provide you with a laundry list of things for which to watch. While I agree that the February low was a 20 week low, I do not quite understand your rationale for the position we haven’t seen the 40 or 80 week lows yet. If one applies Hurst’s simple harmonic relationship ratio (which I do not always do) to the February low and count backwards, there have been 8 visually evident oscillations of the 56 day wave which implies there have been 4 oscillations of the 20 week wave, 2 oscillations of the 40 week wave, and 1 oscillation of the 80 week wave. Varying opinions, all quite reasonable, exist with respect to how long and what is the proper phasing of the 80 week wave. It is simply a function of one’s underlying assumptions. There is very little doubt that my underlying assumptions concerning Hurst’s model are in the distinct minority! Dear William, Where can I find these bandpass and highpass filters that you use for ninjatrader? Unfortunately you will not be able to find those filters anywhere. I wrote the code myself based on the filter design Hurst used in Profit Magic.